toxic ...and when critters eat the dead things they become toxic, too. I thought the reason one didn't didn't use herbicides and pesticides was because they didn't want to poison the creatures higher up on the food chain. But...that is not the only reason! both good and bad bugs...just as nature intended. And there was balance; generally one insect didn't wipe out a crop, as there were other insects on hand to curtail the bad ones. The point is...they quit using poison and bugs came back. Duh! I garden for both me and the birds. 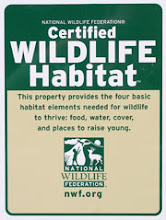 I plant for a natural habitat...a beautiful, soothing yard with shelter, water, food and nesting-sites for birds. I make puddles for frogs. I move snakes out of the way when I mow. I'm tickled to see bees. I like bats. I encourage all manner of critter to visit here. And, I don't use poison. But, the reason I don't use poison is because I don't want to kill the birds and other critters I enjoy. I never stopped to consider that should I use poison in such a way that the birds couldn't ingest it, they still wouldn't come! Why come if the bugs are gone? Duh!!! Just today, I watched a Yellow Warbler foraging in the Chokecherry bush. No...the fruit is not ripe, it is hardly even getting started. But there are aphids! I noticed the other day that on several young branch-tips, leaves were curled and inside were the tiny insects...each 'herd' managed by an attending ant. Too wild...but I knew that. And I used the hose to mitigate some of the potential damage...getting soaked while doing so. But it wasn't until I watched the warbler that I realized I'd just cleaned off much of the bird's meal! I flushed away the very natural thing that was attracting a non-seed eating bird to visit my yard. Sheeshhhhhhhhhhhhhhh... Ya know, the bushes had a few branch-tips with curled leaves last year...but the plant was not stressed and it did just fine; lots of berries were had by many, many birds. I often turn captured spiders out of my house...not just to save the spider, but also because it might make a meal for a bird. 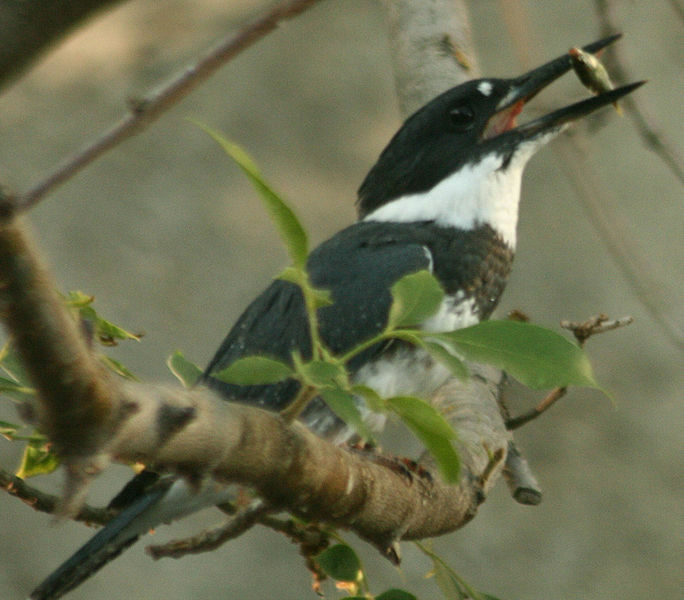 When I catch a mouse in a kill-trap (they tried to nest in my linen closet), I offer up the perfectly safe meal to the magpies who come to my yard; they swallow 'em in a single gulp! 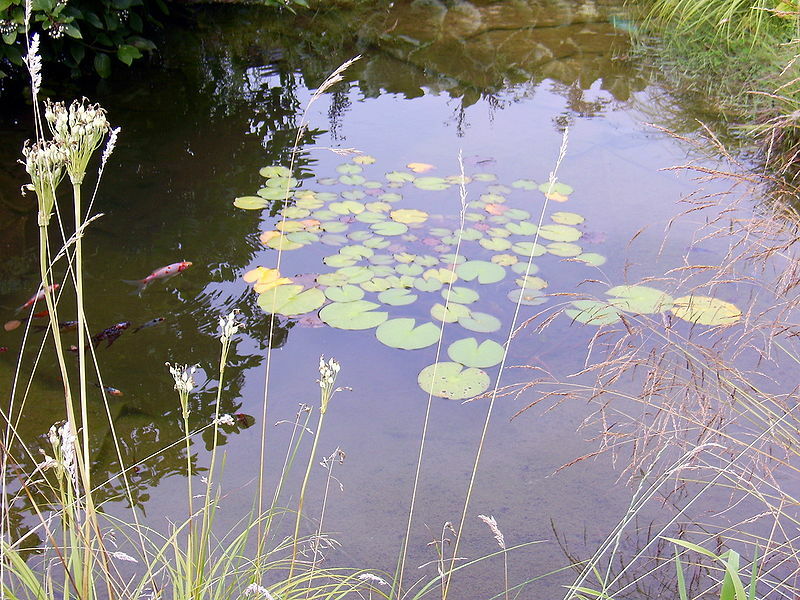 When my pond is finally built, I'll add some fish for color and my delight...but not Koi this time. Nope, I don't want to feel slighted when a bear or a raccoon or a snake make a meal of an expensive fish. I'm building the pond for my pleasure...and to attract birds. Should I manage to entice a local kingfisher or perhaps a heron over for dinner, I want to know that I'm observing the natural order of things...even if I did create the little puddle. Oh sure, I'll create hiding places for the fish with rocks and plants, this won't be like bobbing for apples in a barrel. I offer seed to birds too, and plants that provide fruit...but I don't begrudge the hawk who hunts here, either. I don't know why I never followed this logic to this point. 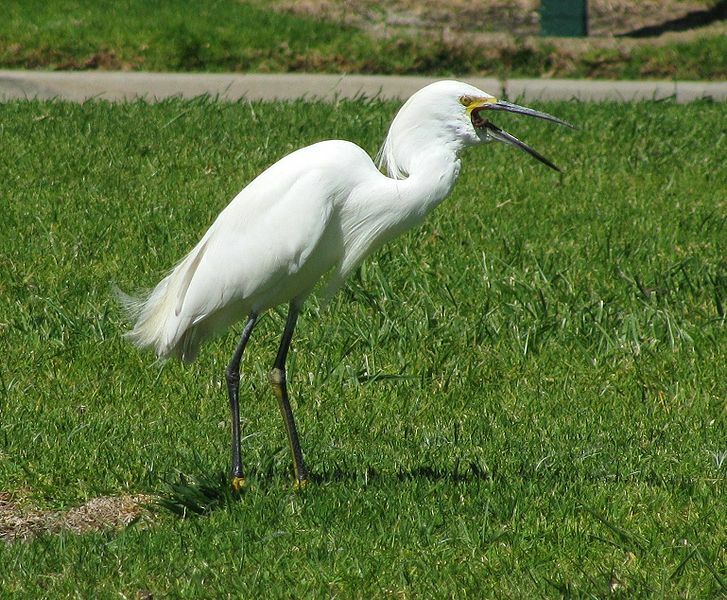 Who knew removing insects removed one of the reasons birds come to the yard at all? 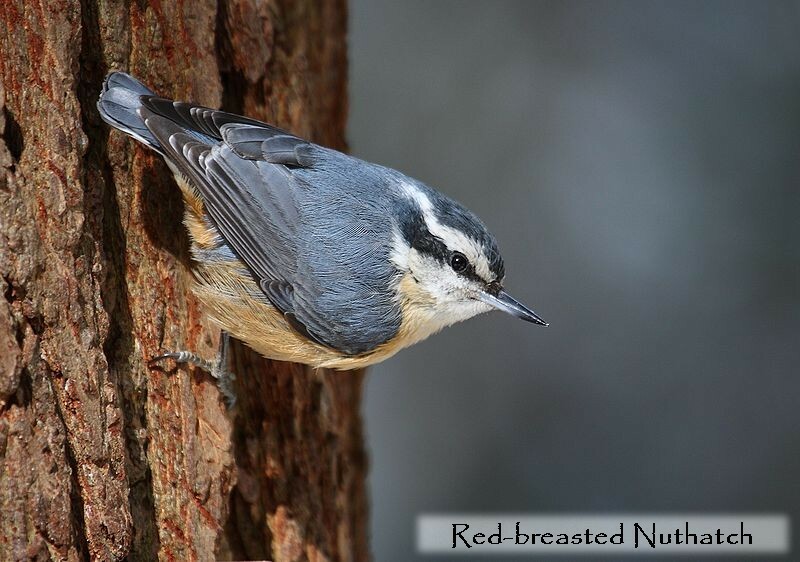 I offer plants with berries, seeds in feeders, suet, nuts, nectar, assorted leftovers, the occasional mouse and soon fish, too; but, I never considered the bugs in the trees and worms in the grass were dinner to a whole 'nuther batch of birds. The lovely Yellow Warbler photograph is by P. Nelder, whose work you can see here. The other shots are from Wikipedia. My yard is full of fledglings; young birds that have recently left the nest. Parents bring them here, where the livin' is easy. I like to think I give them a head-start into the real world. Birds don't have it easy these days. 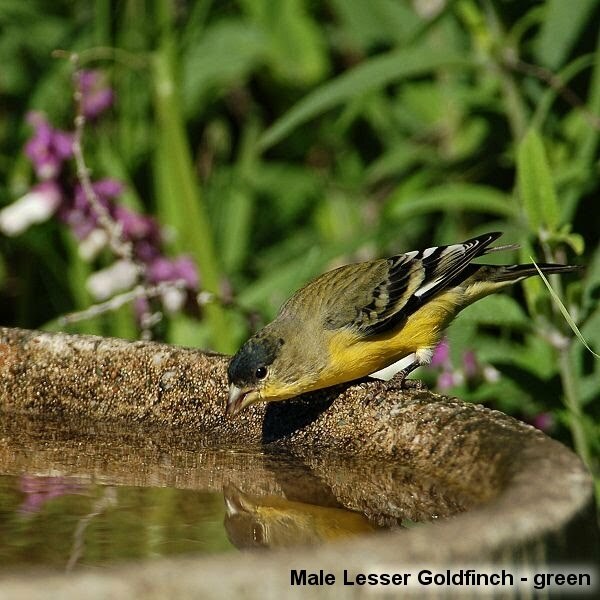 Five or six black-backed Lessar Goldfinch are also visiting again. I swear they remind me of sleek seals; so dark on top and bright yellow below...with a bit of white on their wings. 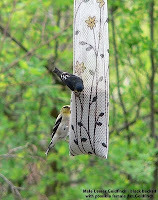 Stunning little birds; nearly half an inch smaller than American Goldfinches and about half the weight. I love it when they visit. Most of the shots here are from Wikipedia or BirdFreak's site, but my favorite is from this blog. It's amazing what one finds just Googling a bird! Or click here to get to the specific page where I found the photo. You can see that it is really quite easy to tell an American Goldfinch from a Lesser Goldfinch (be they green- or black-backed)...as long as you are discussing males. Females...not so easy; at least for me. 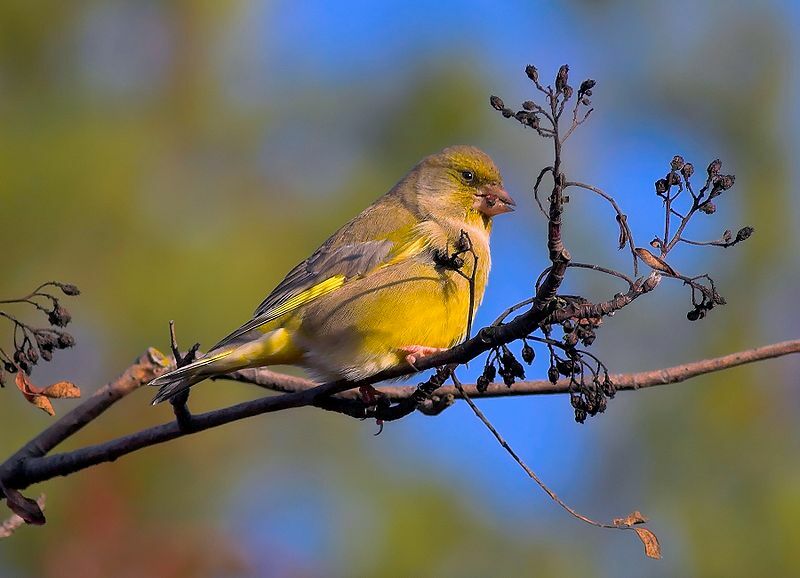 This is a female American Goldfinch, according to the photographer. 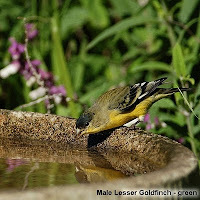 In my mind it could be a young male or non-breeding American Goldfinch, or a female Lesser Goldfinch. I still do not have the eyes to see; apparently one has more yellow at certain times of the year...but who and when? I have much to learn! Now that natural food (bugs) are more plentiful, I've cut back a bit on the number of feeders I keep full. Thank the gods that the grackles, black-birds and cow-birds are here in greatly reduced numbers, too; partly because the feeders I've left up are difficult for them to feed from and some contain only safflower seed. All the grosbeaks love safflower seed, and some of the other birds too...but not the Icterids so much. I still put out peanuts for the jays and magpies...which draw the blasted black birds back in. Ugh! Anyway, it is hilarious to watch a young magpie discover peanuts-in-the-shell. 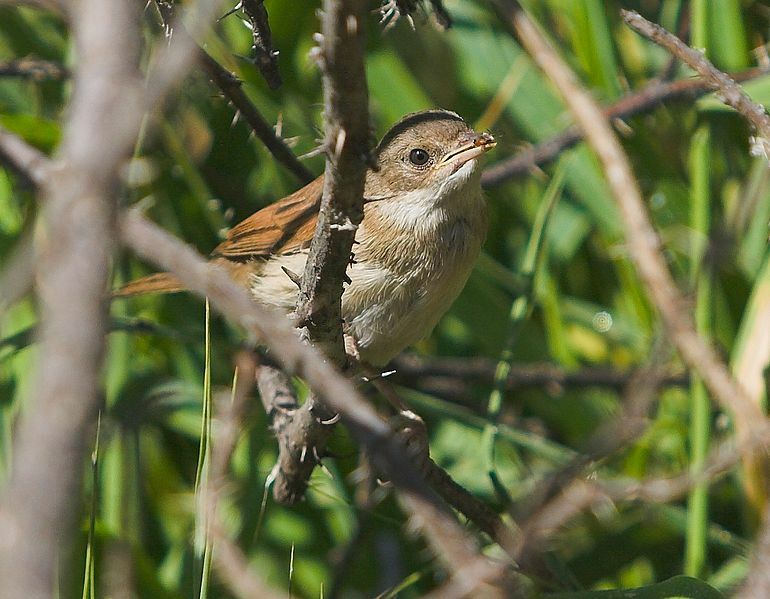 As you know, young birds are nearly full-grown when they fledge...but regardless of their size, they are babies. So, these big lunkers land on the feeder and pick through the peanuts...all the while squacking and whining for their parents. They flap their wings and assume that begging position, as if to say "I can't open it...how do ya open 'em; show me how to open 'em!" Too funny. And grapes. I put out bunches of old grapes I get (discounted) and have discovered American Robins will actually come to feeders for them. That's a first, to see a robin at the feeders. They sure do like grapes, but they are most unhappy that the magpies come, too. I regularly watch one or two robins mix it up with a magpie; harassing and dive-bombing them; finally driving them out of the yard while they fly behind in hot pursuit. This morning, I realized why; there are several full-grown, but spotted and streaky young robins hunting on the grass. Now that the grapes are gone (for now), mom is teaching them the grape jelly is pretty good, too. Who knew? In the early evenings I see swallows and Common Nighthawks. I really cannot identify the swallows...as high and fast as they fly, all I know is that they are swallows. What I did identify though...and all by myself (!) 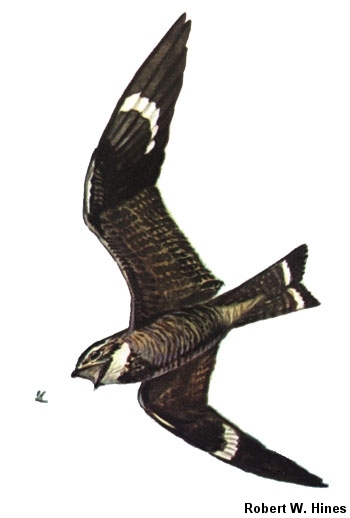 were several Common Nighthawks. They fly like big, clumsy bats; probably why they are called Bull Bats, but the identifying marks are the white patches just below the 'wrist'. This patch is nowhere near the wing-tips as in a Lesser Nighthawk...which don't frequent this area, anyway. As thrilled as I was to ID a bird myself...it was an easy mark. I love both of these beautiful paintings of this bird. How many can you find in the one on the left? 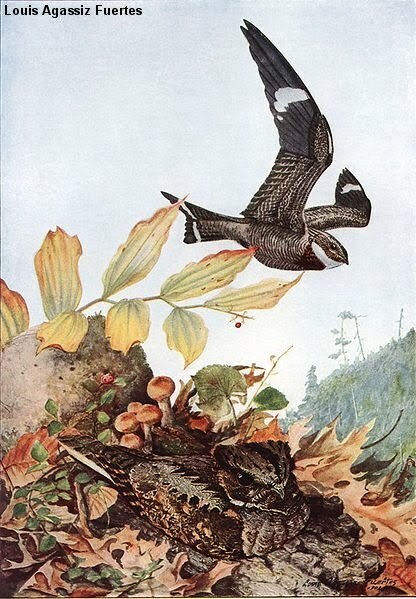 The Fuertes portrait shows how these birds are expertly camouflaged, while the one by Hines shows how wide a mouth these birds sport. I used to see them all the time on the dirt roads up by the cabin where I lived here in Huerfano County; lying on the roads there is a bad habit they have...if I do say so myself. Today I have been watching lots of fledglings. Young robins have blotchy, streaky bodies and look pretty much like a whole different bird...one with a 'tortishell tummy'. There are a very many House Sparrows youngsters...birds which generally I don't see many of in my yard. 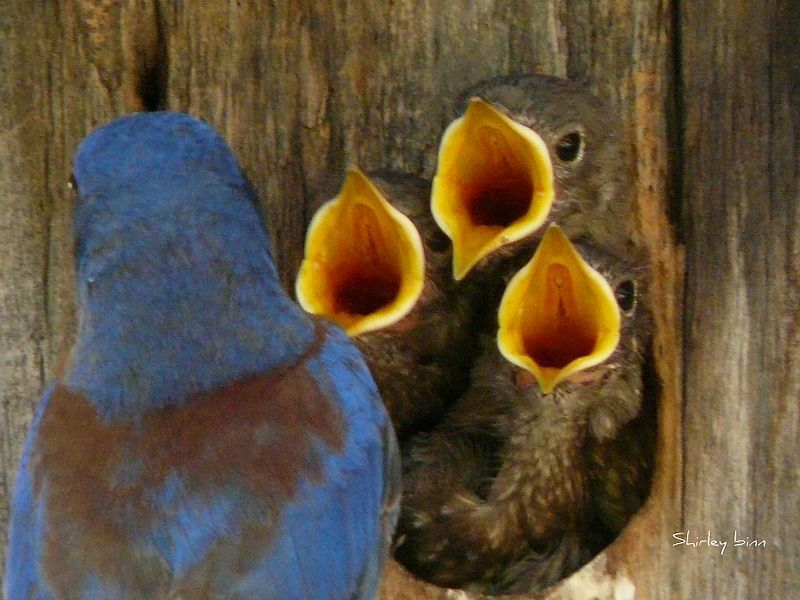 But right now they all have so many mouths to feed...they bring them here. For all their evil ways, they are good parents...which is perhaps why they are so successful an invader. Also exhibiting good parenting skills are House Finches...who have to put up with the most insistent, badgering youngsters I've ever seen. These babies don't just sit and wait, they chase and harass their parents non-stop. At least the males are right in there with the domestic duties. 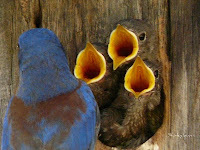 These three mouths belong to young blue birds, also excellent parents. By the time the bird fully fledges and leaves its parents for good...its bill will look like that of an adult. 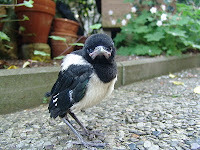 You can still see the short tail and youthful bill of these young magpies. Generally, I don't recognize first year birds...if they are much different than their adults; and many are. I just assume I'm looking at a 'different' bird. Downy and Hairy Woodpeckers are an exception...well, at least the males are. 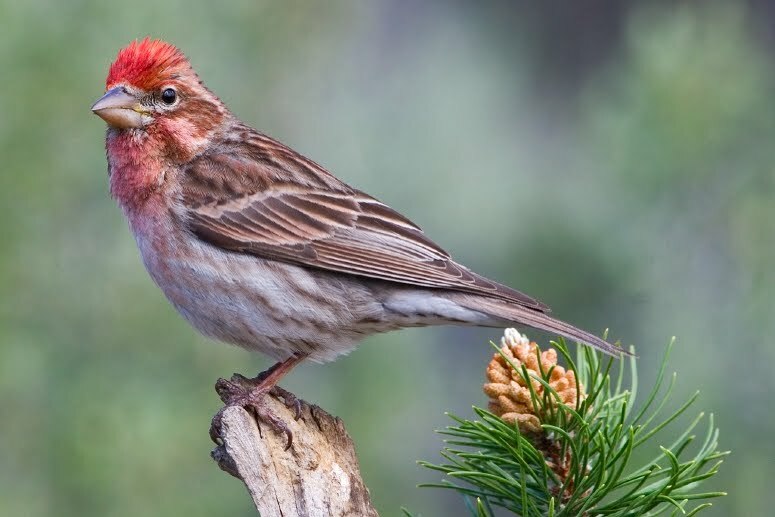 The red on their heads begins forward, and gradually 'moves' to the back of the head. They are adorable, especially when still a bit fluffy from the nest. I've never seen a parent feeding a youngster at my feeders. What I imagine are very young White-breasted Nuthatches are those with ill-marked coloring. Not unlike a young White-crowned Sparrow whose head goes through a blurry, 'checkered' look before exhibiting that beautiful, clear black and white; I think the striking white head and wide black head-strip from bill to nape on a young bird is also a bit 'blurry' compared to the crisp lines of adults. They hunt along the fences, the stakes keeping my dog out of my young shrubs and also come to the feeders. However, just like a youngster might, they are hesitant and timid. They look around before they begin picking at seeds. Parents always seem to be on a mission; in and out...quickly. environmentalist/teacher from the La Junta area, Duane Nelson was at my home to see Rosy-Finches. Oddly, while here he ran into two other biologist/birder/guides; Tammy and Ira from the Denver area. They are friends of his. Ira is the one who pointed out the first yellow-shafted Northern Flicker I ever saw...right here in my yard; it's a small world. Already feeling tickled pink to have met three more fascinating and knowledgeable people right in my own home, Duane pointed out another first...the Red-breasted Nuthatch. He said he imagines I've always had them. 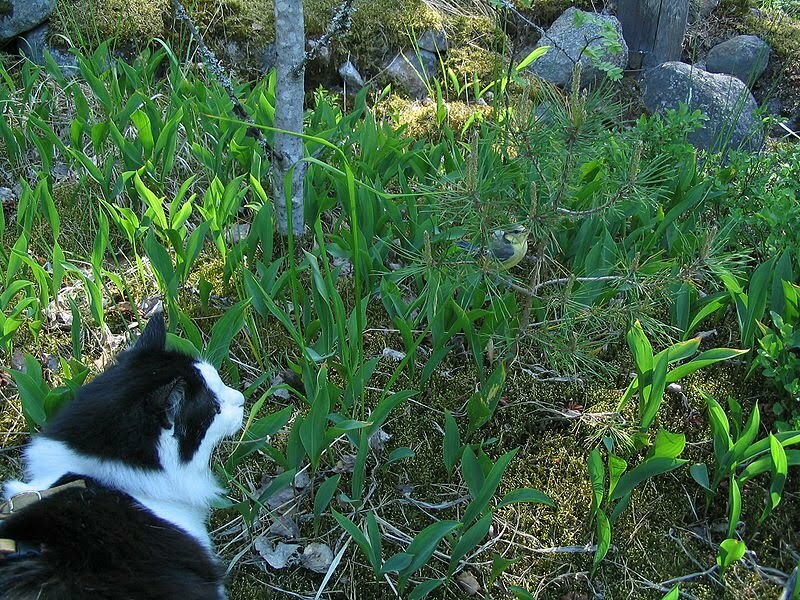 I imagine I might have seen them and dismissed them as badly-viewed Mountain Chickadees. Here are two pictures that compare these birds. Oddly, I only saw them another day or so and certainly have not yet seen any youngsters. 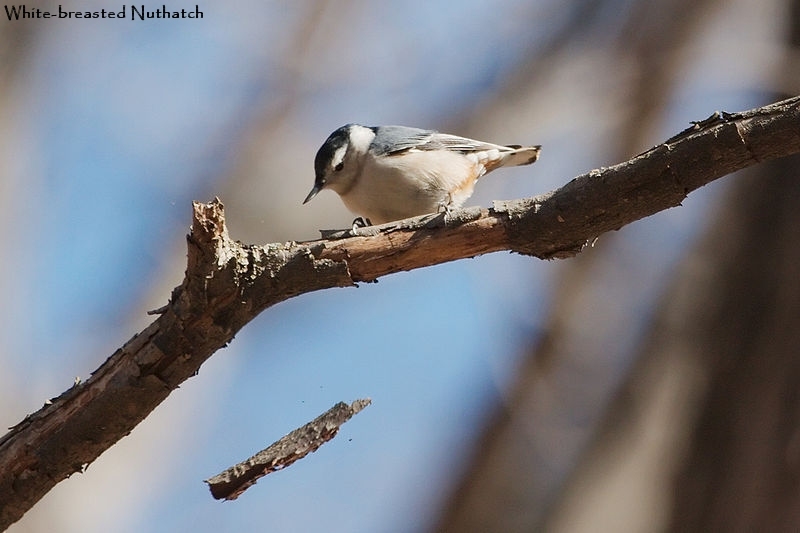 But then I haven't seen any chickadees of late except one...badly seen, just the other day. Might it have been one of the Red-breasted Nuthatches? Speaking of fledglings. 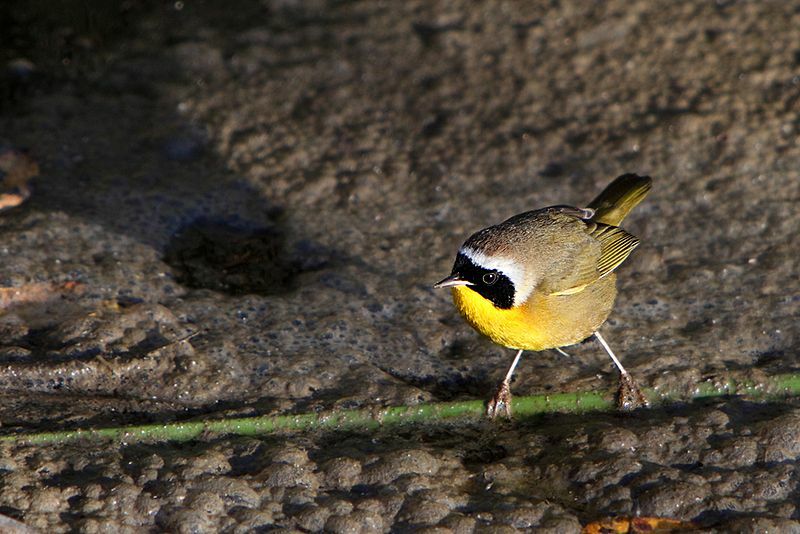 Many of us have come upon young birds that sort of 'freeze' when we come close. Some folks think that means they are tame, or perhaps injured...but it does not. Still birds attract little attention. Cats however, skulking along low on the ground, find them easily. As much as I like cats, I look forward to the day with they must be kept inside or in 'cat-runs'...or on leash. 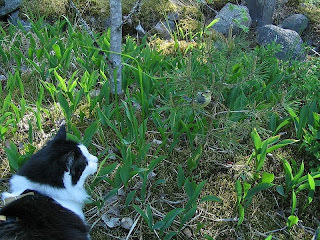 There are so many loose and feral cats that they are seriously decimating our song bird populations. And those populations are already under siege from fractured habitat, wall-to-wall lawns, poisons and climate change. A single hunting cat may only catch a few dozen birds and mice (also removing bird and other creature's food suply) over a year's time...but multiply that by the thousands upon thousands of cats that hunt and you must realize cats are responsible for as many as a million birds per year. It's astounding. for many small predators, including cats. that the cat was held back on a leash. 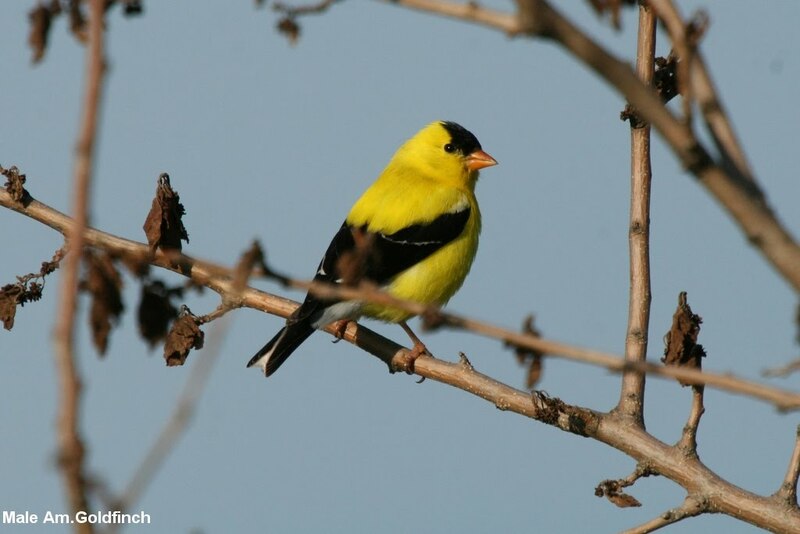 As the spring migration winds down…so do the numbers of each species I see in my yard. Where earlier this month I had half a dozen Rose-breasted, nearly two dozen Black-headed and only a few Evening Grosbeaks. Even last week I regularly saw, every day, 1-2 Rose-breasted but they seem to have moved on. 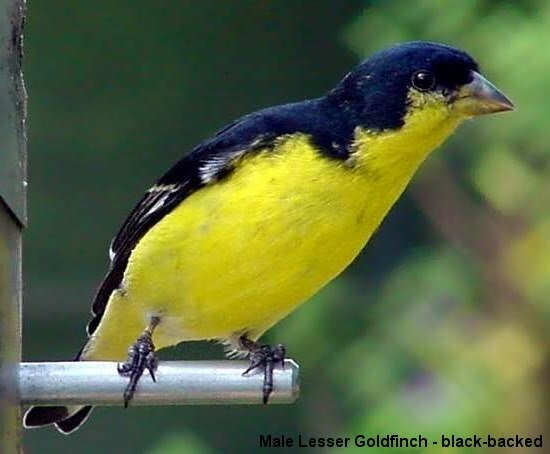 Still here are half a dozen Blacked-headed and now more than 30 Evening Grosbeaks at a time! I love this photo; I got it from Wikipedia, too...it sure shows ya where these babies get their name. It also is a good shot of the bill-color, which changes during breeding season, to a lovely sort of teal. Anyway, Bullock’s Orioles numbers are down from two dozen or more to only half a dozen or so at a time. 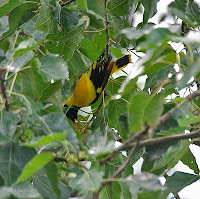 For awhile I watched ten or more Western Tanagers and now see only 3-4 at a time. 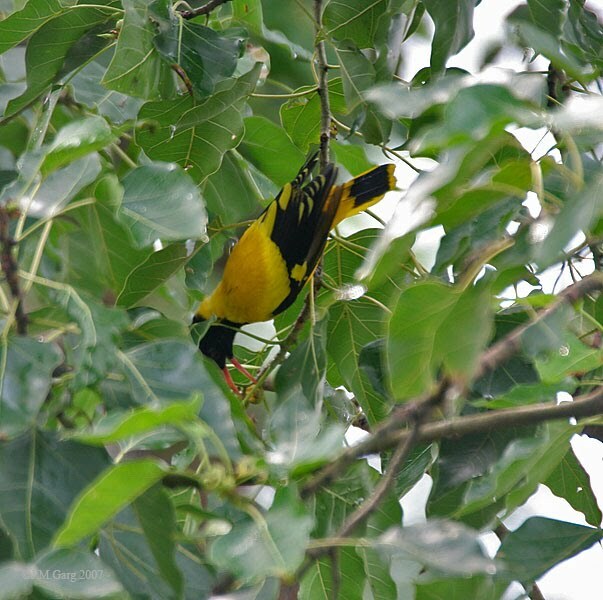 I wish they were still here in such great numbers, as the Bullock's Oriole is one of the few bird species that will puncture and eject Brown-headed Cowbirds' eggs and Western Tanagers will attack and drive away female cow-birds that enter their territory. My neighbor Polly and I believe the Orioles, Tanagers and Grosbeaks are all nesting around here. I suppose the pairing-up and nesting duties are what have happened to the large flocks. The Broad-tailed and Black-chined hummers are both here for the long summer. The little Calliope's breed in Alaska and only stop here on their way home...just in time to put up with the pugnacious and beautiful chocolate-brown Rufus Hummingbirds. They remind me of my coffee...just as I add the cream. I have not seen the Lazuli or Indigo Buntings in over a week; nor the Chipping or White-crowned Sparrows or the Black Phoebe. What I do see from time to time are a pair or more of Cassin’s Finches (I love that pale, pale belly and shock of red on the head), and that little House Wren. This photo from Wikipedia shows a streaky-fronted Cassin’s …the ones I see are beautifully pale-bellied with hardly any streaking. Something else I have noted, which just could be the result of all the tanagers & orioles; the numbers of hummingbirds here, now, seem down…and I’ve heard that comment about town. Both Broad-tailed and Black-chinned hummers have been here some weeks now (they arrived in that order), but generally I don’t see many Calliope’s until after the Rufus arrive in June or July. Last year I had as many as 50 or more hummers in my yard at any one time. It was wild. The pretty little flycatchers are back; a Western Wood-pewee has been in the yard lately. I love to watch them hawking…but would like to learn how to distinguish them from Olive-sided Flycatchers, which are also seen around here. Soon my pond will be finished and full and have that delightfully cooling sound of water falling over rock. I’ll stock it with cheap (but fairly attractive) shubunkins, which breed like bunnies. With the price of sunflower, safflower and thistle seeds, plus peanuts, grape jelly, oranges and sugar for nectar…I rather like the idea of a ‘self sustaining’ bird feeder! Yup, I’ll be tickled pink if a kingfisher or egret or a heron visit. My pond is for the birds! In Denver, I had a pair of mallards drop by to think about setting up housekeeping. Perhaps ducks are not a good idea (ewwwwwww) but maybe frogs or toads will come; I like that idea… One sat in a puddle where the pond will be for a couple weeks this spring; calling, calling, calling… I loved it.